PHOTOS: Kellen bus catches fire in Quezon City (Sept. 10, 2014) - Balita Boss! A Kellen bus caught fire in Commonwealth Avenue, Wednesday morning, September 10, in Quezon City causing heavy traffic in the area. 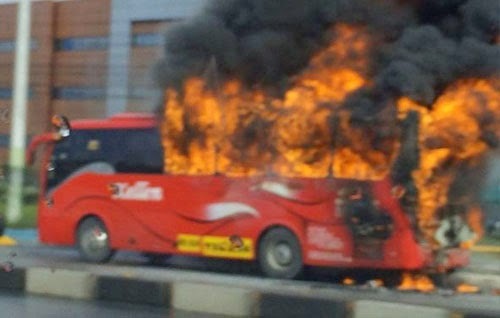 The bus was heading toward the Quezon City Memorial Circle when it caught fire near the Ayala Techno Hub. Netizens took to social media to share photos of the bus. Police said all the passengers were able to get out of the bus safely. However, the driver is still missing. Investigation is underway into the cause the fire.